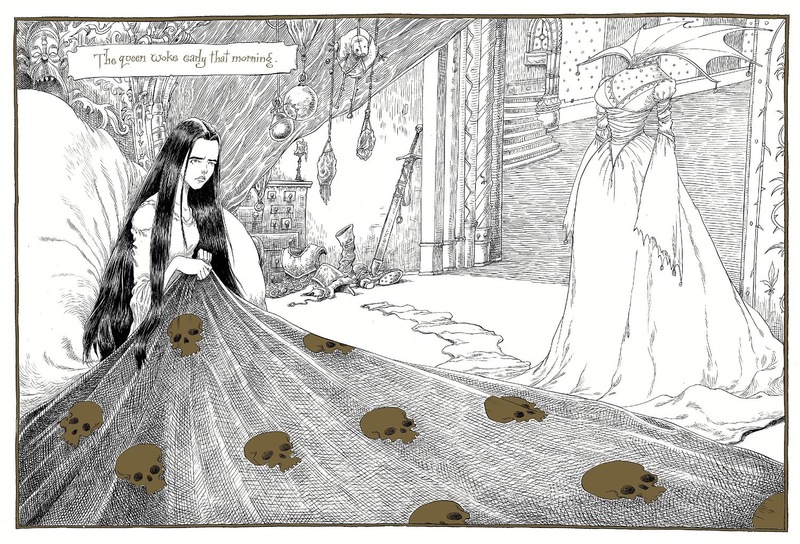 Sleep the Sleep of The AgedA review of Neil Gaiman’s The Sleeper and the Spindle illustrated by Chris Riddell (Harper Collins Publishers, 2014). As a sleeping curse spreads across the land, who would be better to awaken the sleeping princess at the centre of the sleeping curse than a queen who was once a princess who slept for a year in a coffin of glass. 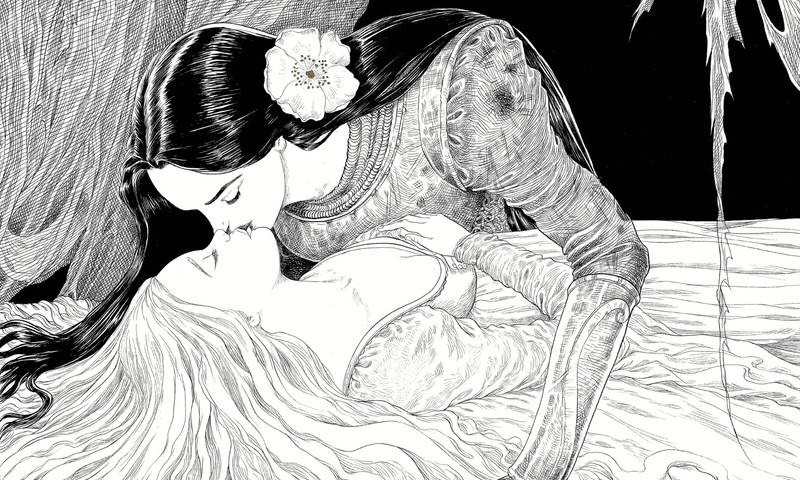 Neil Gaiman re-imagines the Sleeping Beauty tale by infusing it with a visit from Snow White. His tale is one about age and the fear that has been instilled in ageing women about the transformation into old age and the loss of beauty and youth that are treasured by patriarchy. Like the Snow White tale, Gaiman’s revision is a tale about the theft of youth and the fear of ageing. Gaiman links the image of the spindle, the sharp pointed tip and skein of yarn to the things that move while everyone sleeps – the roses with thorns sharp and cruel and the spiders that spin their own yarn over the sleeping populace, entwining them in a tapestry of magic. There is a macabre beauty to Gaiman’s twining of spiders and thorns and the evocation of the image of the spindle whose prick caused this 80 year sleep. Gaiman lets readers see the formation of a fairy tale as the people who are encountered in the tale each tell their own version of what has happened to this Sleeping Beauty, revealing the power of tales to shape themselves out of oral narratives and speculations. Gaiman plays with the power of names in fairy tales by bringing into the narrative the power of names, the forbidden quality of unspoken names, and the idea that names can be lost to years of history. As Gaiman often does, he misleads the reader, taking him or her down a path of uncertainty for a familiar tale, knowing that Gaiman’s path always diverts from the well-worn ones and into the darker parts of the woods that are strung with vines of potential. Riddell’s artwork transforms Neil Gaiman’s story into a mixture of a Medieval illuminated manuscript and a grimoire that casts spells of enchantment over the eyes of the reader. Riddell’s art style keeps colour simple, mixing black and white with gold to add that gilded quality of an illuminated manuscript. His style is similar to the pre-Raphaelite painters with a focus on almond eyes and sleepy beauty – a perfect look for a tale about the spell of sleep. Text becomes part of the spell as letters drip into spindles of yarn, fall into spider webs, and form into rose thorns, binding the art to the text of the story. 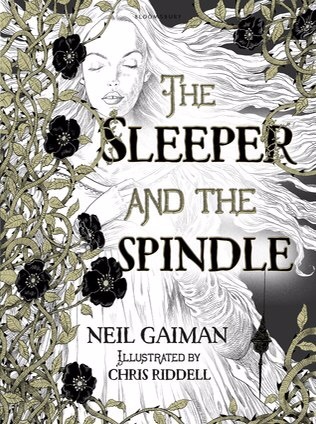 The Sleeper and the Spindle is a potion brewed of the distilled essence of Gaiman and Riddell’s styles, combining them into a form of magic that evokes the imagination and transforms fairy tales into tales of change and speculation.